Tottenham’s on loan Manchester City striker Emmanuel Adebayor has said that he wants to end the season strongly by finishing in the Champions League positions. Tottenham are currently in the competition with Arsenal, Chelsea and Newcastle United to finish in the top four of the Premier league, which will ensure them Champions League football at the end of the season. However, Tottenham have been suffering from poor form of late, which has put doubts over their ability to sustain the challenge until the end of the season. 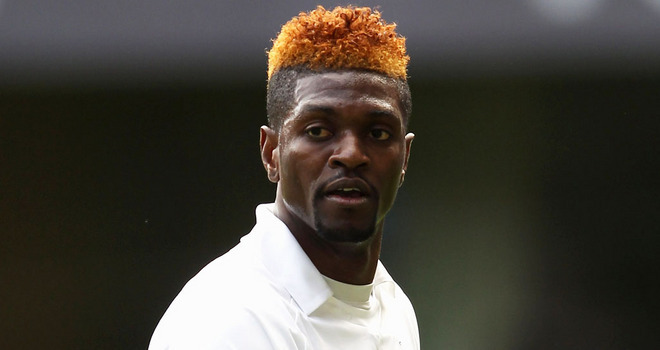 After the 3-1 win over Swansea during the weekend, Adebayor said that he wants Tottenham to finish in the top four. The 3-1 win over Swansea did Tottenham world of good, as it helped them moved level on points with arch rivals Arsenal in the table. Now, the Togo striker has said that one of the reasons for him to move to London must help Tottenham finish in the Champions League. Adebayor is also looking forward to winning the FA Cup this season. Tottenham have been drawn against London rivals Chelsea in the semi-final of the FA Cup. If Adebayor wins the FA Cup, then it would be his first and probably final major trophy with Tottenham. The latest FA Cup betting makes Spurs slim favourites to make it through. “For me my target before coming to join Tottenham was to get in to the top four and we are in a good position to do that now. We are in the FA Cup semi-final as well. We just have to give it a go, try to give everything and finish in the top four, and why not win the FA Cup as well? When Swansea pulled it back to 1-1 it was quite difficult, but in the head we have a good squad, we have belief,” Adebayor said after the 3-1 win. Spurs now lie in fourth spot in the Premier League, and are odds-on to qualify for the premier European competition next season according to the Betfair Champions League odds, though no doubt Chelsea will push them all the way. « Adebayor 07-08 so far…..